1971 Alfa Romeo 1750 FI USA models Maintenance Manual. 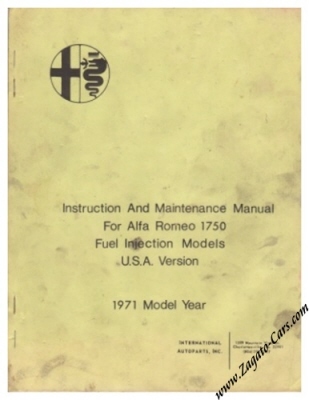 Vintage 1970 / 1971 Instruction And Maintenance Manual for Alfa Romeo 1750 Fuel Injection Models U.S.A. Version 1971 Model Year. Issued by International Autoparts Inc, Charlottesville, VA, USA. Decent condition for a workshop item of this age. A VERY handy piece of literature for the DIY Alfa mechanic!